Choking balun for lower HF and MF bands. (1.8MHz - 10MHz). Requiring a choking balun to isolate the potential RF pick up on the coax cable as it runs past equipment such as computer within the radio room at lower HF and MF frequencies a simple method of winding RG58 coax onto a Powdered Iron Toroid Core was constructed. The construction was simply to wind as many turns of RG58 coax onto the T250-26 Powdered Iron Toroid Core as would fit. The result of 23 turns achieved a 130uH series inductive reactance to common mode RF currents. About 3mtr of RG58 coax. Photo 1 Low band choking balun assembled. The AIM 4170C antenna analyser recorded a 130uH inductive reactance with intertwining capacitance resulting in a series resonates at approximately 3.2MHz. Figure 2 show the inductive reactance as measured in the coax shield presents acceptable reactance from approximately 1.8MHz to about 10MHz. 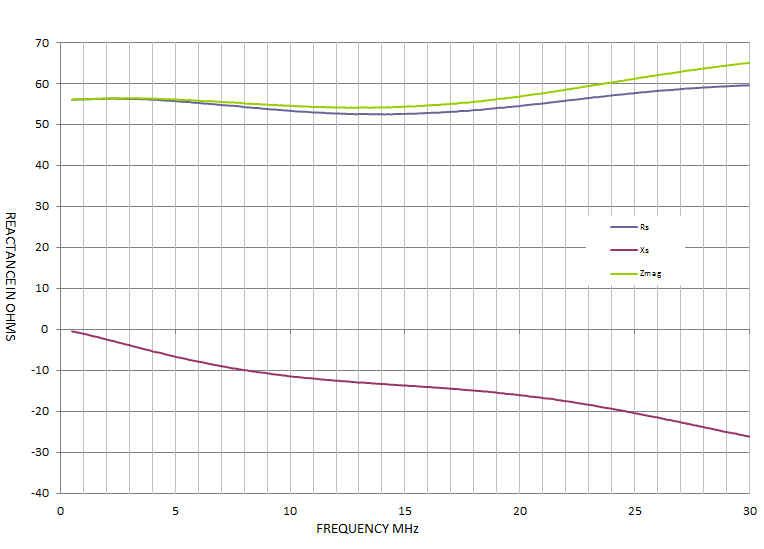 Figure 3 The evaluation of the balun with a 50 ohm load over a bandwidth from 100 kHz- 30 MHz. The balun is shows increasing SWR against increasing frequency from the ideal 1:1. Figure 4 The evaluation of the balun with a 50 ohm load over a bandwidth from 100 kHz- 30 MHz. The balun is shown to introduce some capacitive reactance from the ideal load. 1:1 Choking balun Choking balun for lower HF and MF bands. (1.8MHz - 10MHz) T250-26 Powdered Iron Toroid Core..
1:1 Guanella current balun 1:1 Guanella current balun (1.8 - 30MHz) L15 ferrite toroid core. 1:4 Guanella current balun 1:4 Guanella current balun (1.8 - 30MHz) L15 ferrite toroid core. 1:1 Ruthroff voltage balun, 1:1 Ruthroff voltage balun (1.8 - 30MHz) T-200-2 powdered iron toroid core. 4:1 Ruthroff voltage balun 4:1 Ruthroff voltage balun (1.8 - 30MHz) T-200-2 powdered iron toroid core. 6:1 Ruthroff voltage balun 6:1 Ruthroff voltage balun (1.8 - 30MHz) L15 ferrite toroid core.